"It's another dreary and miserable day in Cleaverston Heights, and just the perfect weather for a little social unrest." 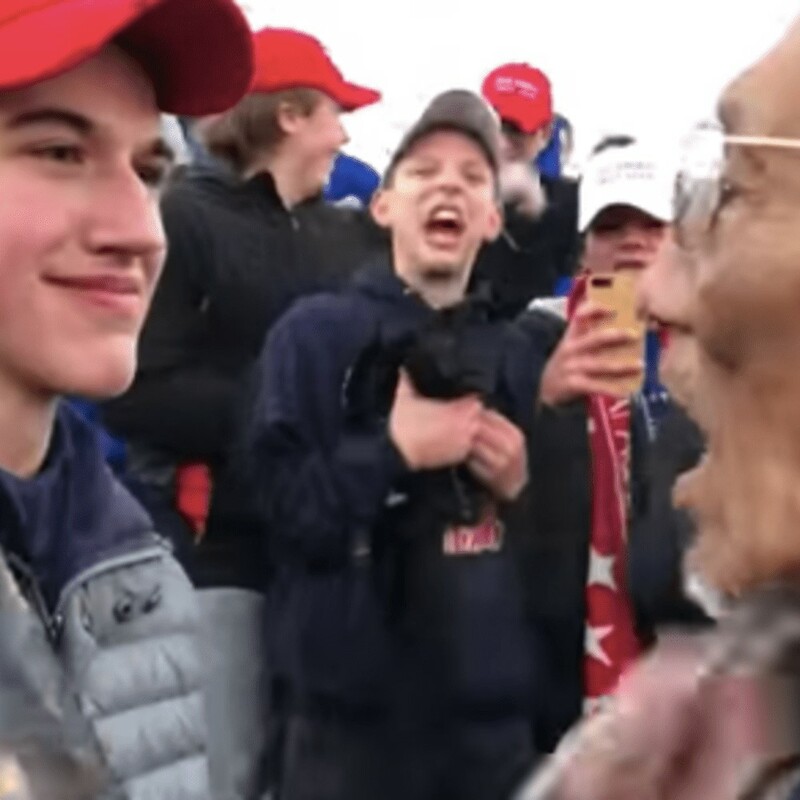 In light of a recent event, one in which a young man in a MAGA hat leered at a Native American Vietnam Vet at the Lincoln Memorial, several took to Twitter to shame those who were outraged, to wit; "Oh, this outrages you?" They would go on to delineate several, previous examples of human rights violations against native people that presumably have not aroused outrage, not to the extent this viral image has. This public shaming of those who are selectively outraged -- why? What is the point? The moment itself is outrageous enough, what does calling the reaction to the moment into question do but create confusion? Like some right-wing website announcing the TRUTH of this HOAX by providing the UNEDITED VIDEO, which no one is actually meant to watch because if they did they would see the same thing, it’s the headline that counts. But as to this idea of selective outrage -- oh, now you’re outraged? No, I am not outraged now. I’m not some middle-aged white liberal guy who just cuts and pastes sad stories, playing into Big Media’s lazy narrative. I’ve been outraged for twenty-eight years, twenty-eight years this week, in fact. Ever since I saw the outpouring of glee on behalf of a large and loud segment of the students at my school burst into celebration the evening the Persian Gulf War began, January 17, 2001. For three nights they took to the streets -- took over the streets! To celebrate a war. I had been on the fence in the past, but that night I became an activist, and even though I do not spend as much energy as others on liberal causes, I have striven to remain educated, aware and vocal. Revisiting the Guerrilla Theater Radio Hour has been an ear-opening experience. I forgot we talked like that. Sure, we spent plenty of time criticizing popular television and complaining about parking tickets, but there were also discussions about rBGH, air pollution and yes, even twenty-five years ago, the use of excessive deadly force against African-American males by the Cleveland Police Department. The best script I wrote for the program was the fourth episode of The Raghouse (see link, above.) That series was set in and around a coffee house, frequented by an array of then twenty-something Generation X stereotypes. The stories were often just an attempt to cram as many hip, early 90s buzzwords into fifteen minutes as possible. For this episode, however, I took the focus off the main character, Biggles Malone (just as well, too, as you can tell I had lost my voice when we recorded this episode) and handed it to Satch, who carried the narrative into the realm of social justice and activism. What this episode has to say about what white people choose to get outraged over -- and what they do not -- has unfortunately withstood the test of time. Not to ring my bell too loud, the episode also included an ugly racial stereotype, a one-off joke that I thought was pretty funny at the time, but am now entirely ashamed to have written and broadcast. It has been edited out of this sound file. Have a good Martin Luther King, Jr. Day.